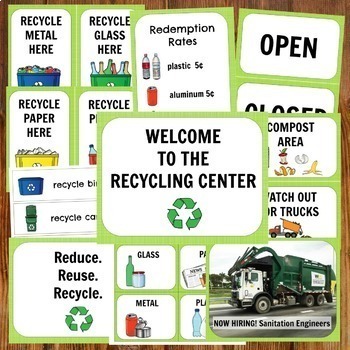 This pretend play pack includes all of the printable props you'll need to transform your dramatic play area into a Recycling Center. Children love to learn about the world around them and the people in their community. One of their favorite community helpers are sanitation engineers who come to pick up the garbage and recycling. 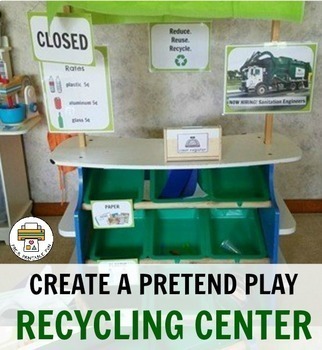 You can create your own recycling center by gathering a variety of recyclable materials. Be sure to spread the word to your parents/clients that you are looking for these items-chances are they have some they can donate! You can include items such as: Yogurt cups, empty water bottles. cereal boxes, egg carton, magazines etc. Set up bins or boxes for recycling. Label each on for sorting: Paper, Plastic, Metal, and Glass. 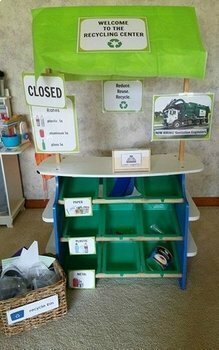 Take some time to talk to the children, and Read books about Recycling and Redemption.